The later years of Aulus Plautius were taken with consolidating the Roman position in Britain. After his departure, the tribes began to revolt violently against their masters. In the winter of 47 AD., tribes from outside the Roman occupied territory began assaults on the positions to the south. There had been a change of governor, with Publius Ostorius Scapula now in charge. He did not hesitate and confronted these insurrections not with the full might of the Roman army, but a number of lightly armed cohorts. The Romans began to consolidate their position even further by preparing to tame everything this side of the Trent and Severn. At this time Roman troops were sent north to the frontier in what was seen as the next move in conquering the remainder of the country. This was seen by the southern tribes as an attempt to make their lands into a total Roman province, thereby losing their identity completely. 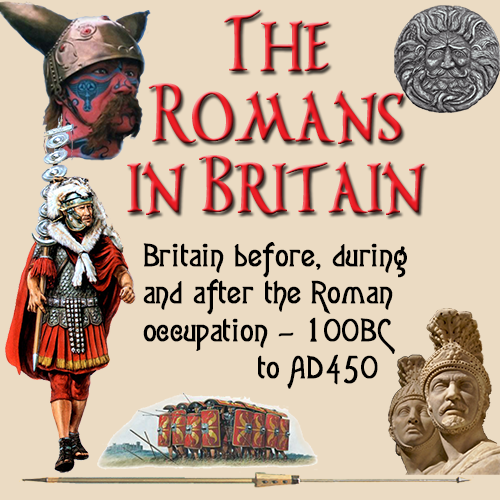 The Iceni had been very much pro Roman during the invasion, and rebelled for the first time. This must have been planned in advance as other tribes also joined the revolt, though history does not specify which tribes there were. The tribes were defeated after a fierce battle. For some reason, Ostorius again used his auxiliary troops instead of his regular legionaries. This battle was probably fought at Stonea Camp, a fortified island near what is now March in Cambridgeshire. This was a great victory, as Ostorius had not used heavy tactics against the Iceni, which must have made them realise that the Romans were a mighty force. Stronger than the tribes had expected. Ostorius most likely used this tactic to make the tribes less liable to revolt. If the auxiliary troops could quell a rebellion, what could the highly trained regulars do? This was noticed by the other tribes and must have made their desire for rebellion less likely. This was a bad mistake by Ostorius as it was the policy of disarmament that had caused the uprising. The Romans were prone to making this sort of mistake. making changes to conquered lands, without first thinking about the effect it would have on the natives. Ostorius first drive was North West into Wales where he met the Deceangli. The tribes offered little resistance, maybe having heard of how the Iceni were defeated so easily. Ostorius pushed on, ravaging the territory and collecting anything he could that would be of use to the Romans. As they progressed, news came that there were outbreaks of trouble amongst the Brigantes. This demanded his immediate attention as peace in non occupied areas was vital to their security. Their answer was swift and total. Those who had rebelled were executed. A case of total over reaction maybe, but it gave out a warning to the whole country that resistance of any sort would be dealt with using extreme measures. Ostorius wanted to spread the province, not fight needless battles with revolutionaries. Even so, the writing was on the wall. There was unrest in, what was becoming, the client kingdoms. This was the start of the end for the Romans. Now Caratacus, who had fled to Wales from eastern England after the 'Battle of Medway' reappeared. He was now leader if the Silures of South Wales. Little did Ostorius know that Caratacus was later to be general commander of the opposition to Roman rule. He would be centered on the central territory occupied by the Ordovices. The date is now 49 AD. The Silures started an uprising. This was viewed as more serious than the previous Brigantes revolt and needed firmer action. Although the Romans did not know it, this was to have serious consequences. A legion was taken from Colchester to deal with the Silures. As the Romans had already deployed all their legions at strategic places, a group of military veterans was established to hold the this eastern city. Their primary purpose was to show a presence in the territory and to teach the locals to rules and procedures they must follow. In short, to turn them into obedient Roman citizens. This was the first site to be established as a Roman colony (colonia) Many of the legionaries must have been close to discharged. A colony was a deliberate foundation, the inhabitants all being classed as Roman citizens. Usually these colonies consisted of discharged soldiers. This meant that Colchester was at the top of the list of provincial cities, a symbol of Roman power. When a territory was conquered, the estate and land would then become the property of the Emperor. In this case the they were given to Claudius' legionary veterans. Meanwhile the troops sent to Wales to fight Caratacus where engaged in battle with the tribes once again. Over the years Caratacus had been building up his power and had a high degree of authority amongst the opponents of the Roman forces. The sight of this battle is not certain, although it was most likely where Newtown resides near the river Severn. The Britons had positioned their forces on a steep ridge above the river and had fortified the surrounding area. Ostorius was reluctant to launch a full scale onslaught on this position, but his soldiers were loyal and eager to fight. They crossed they Severn and the tactics and sheer willingness of the Romans to win overcame the warriors. Caratacus' family were captured. His wife and daughter taken and his brother surrendered. Caratacus though fled north west to the Brigantes. This was a bad move, as the queen of the Brigantes, Cartimandua, was pro Roman. The Roman governor had already put down a rebellion amongst the Queen's subjects. Not wanting to get on the wrong side of the Romans, she ordered that he be taken and given to the Romans. This was treated with exhalation in Rome and boosted the image of Claudius. As is the norm, the Romans were eager to show off their triumph and capturing such an important member of the enemy, that he was taken to Rome and paraded in front of the Praetorian Guard. It was also the customary for the captured leader to make an address. It is not recorded what he actually said in his speech, but he must have a made very deep impression upon the Senate. The end result was the Caratacus and his family were give a pardon. Again this scored more points for Claudius and he had one again outshone his ancestor, Julius Caesar. While the Romans were fierce in battle, they were, for some reason, merciful to those whom they defeated. Ostorius was honoured, but there may have adulation of him in public and criticism of him in private. Despite this show of support, the Senate would have received word that the Britons were still resisting and this would not be good for the Roman commanders in Britain. Ostorius directed that the Silures were to be wiped out or moved to a new location. Several attacks were launched on the Silures, the Romans gathering prisoners and treasures as they went. The Romans were gradually making a new confederacy. The Silures were saved from complete extinction by the sudden death of Ostorius. The Romans now had a divided province with tribes both pro and anti Roman sharing borders. The country had to be calmed. The Senate was tiring of the situation in Britain and wanted it resolved before the Claudian image of victory that Rome was presenting would be damaged. A new governor was appointed with due speed. The new governor was Aulus Didius Gallus, a man with an impressive record who had been decorated for his successful campaigns in southern Russia. Without a leader to guide them, the Romans were lost. By the time Didius had reached Britain, the Silures had defeated a legion, something unheard of before. They were now making advances into Roman territory. The arrival of Didius did at least restore calm. This did not last and as soon as Didius had managed to restrain the Silures, ten the Brigantes began to rise up. Venutius, husband of Queen Cartimandua of the Brigantes, was the best military leader in Britain after the capture of Caratacus. He had been placed in power by the Romans after the last Brigantian uprising. As he was leading this revolt, this now means that husband and wife were opposing each other. He leading the tribe in rebellion, and her trying to appease the Romans. Cartimandua to the family of Venutius prisoner, presumably to pacify the Romans and, at the same time, blackmail Venutius. He retaliated by invading her kingdom. The Romans intervened, send first the auxiliary troops into battle. They did not manage to defeat Venutius, so a whole legion was dispatched to end this uprising. This they did and Cartimandua was placed back on the throne as Queen of the Brigantes once again. For Venutius, this was merely a setback. The Romans had not heard the last from him. Emperor Claudius died suddenly in 54 AD. in highly suspicious circumstances at the same time of the Brigantes rebellion. His stepson, Nero, came to the throne. In his writings, Suetonius says that Nero once considered abandoning Britain as it was taken too many resources to hold the country. Resources that could be better used to expand the Roman Empire. With the death of Claudius, his friends and advisors also disappeared from the scene, though not in such extreme ways. Claudius was elevated to the level of a God, but also allowed him to become a subject of ridicule. Such is the attitude of the Romans to treat a late Emperor in this manner. Even so, Claudius had an outstanding military reputation. The Romans were a very proud race and believed that public image was paramount. If Nero had withdrawn from Britain it could had been viewed as a deformation of Claudius and all the victories he had had accomplished. Maybe it was for this reason that Nero stayed with the British situation. C. Suetonius Paullinus succeeded Veranius in this office. He too had a strong reputation in military circles. He had been the first Roman general to make a crossing of the Atlas mountains in Mauretania and so was experienced in mountain warfare. This man had been the reason he had been chosen to lead the forages into Wales and the Pennines. By 60 AD., he had taken Wales and was preparing to cross the waters to Angelsey. This island had become the last point of retreat for the rebels. Being surrounded by water, this was logical since the British forces could only retreat towards the sea. The Druids, seen as one of the strongest band of people in Britain, were also on the island. Angelsey was to be no pushover. It is written that it was defended by praying Druids, fierce warriors and wild women. The assault and taking of Angelsey was brutal, bloody and savage in the extreme. These people were fighting for their lives with no avenue of retreat. Paullinus was so engrossed in these battles that he did not see that behind him the worst from the British was yet to come.